Seeing each other before the wedding. The idea that the couple shouldn’t see each other before the wedding originates from the arranged marriage days, when the bride’s family wanted to give the groom as little time as possible to back out of the deal if he wasn’t pleased with what he saw. Today, though some brides want to make the day more exciting for a “big reveal,” it’s also common for the couple to meet for photos before they say their vows. Rain on your wedding day. Although most couples keep their fingers crossed for clear skies, in many cultures rain on your wedding day symbolizes fertility and cleansing! Imagine the romantic kiss-in-the-rain wedding photographs you could get. Using your married name before the wedding. Some think it’s tempting fate to use a new last name before the vows are said. If you’re superstitious, you could save the monogramming for your registry items to avoid jinxing yourself. Crying on your wedding day. A crying bride on the wedding day supposedly symbolizes that she has shed all her tears and will not cry during her marriage. Don’t forget the waterproof mascara! Receiving knives as wedding gifts. Knives are supposedly bad luck to give as a wedding gift because they signify a broken relationship. If you receive this gift, just give the giver a penny; that way it’s a purchase, not a gift. 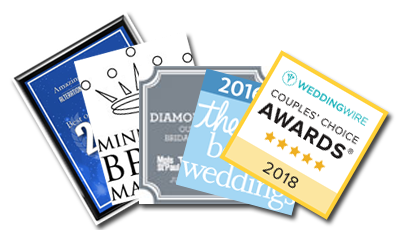 Whether or not you believe in these things, we like to remind our clients that on your big day, the only thing that should matter is your happiness. No wedding is ever perfect, but every couple has every chance to make the best of the big day. The most memorable things will be the imperfections and unexpected details; take every moment in stride and remember to make each second last. Be present. Your wedding will be one of the best days of your life. We would love to be a part of the team that makes your wedding day a success. Call Amazing Alterations today at 763-432-5243 or email us at appts@amazingalterations.com to set up a free consultation. We look forward to meeting you! When glancing through article I saw that knife thing and I thought: Say what? Then I read that it was bad luck to give knives. That’s more like it.